That’s one small step for woman, but one giant leap for womankind. I would enjoy having dinner with Judy Chicago. She is not only a feminist artist, but she is also an author and educator. Chicago has inspired a vast amount of people through her artistic works and projects. For instance, Judy led 150 needle workers for the Birth Project. Additionally, she was able to direct hundreds of women for her project called The Dinner Party. Chicago would be an interesting person to have dinner with because she has a unique vision and has great leadership capabilities. I would enjoy discussing how she creates different projects and learning about her passion for modern art. Who is your favorite modern artist? Do you have a favorite artistic movement? 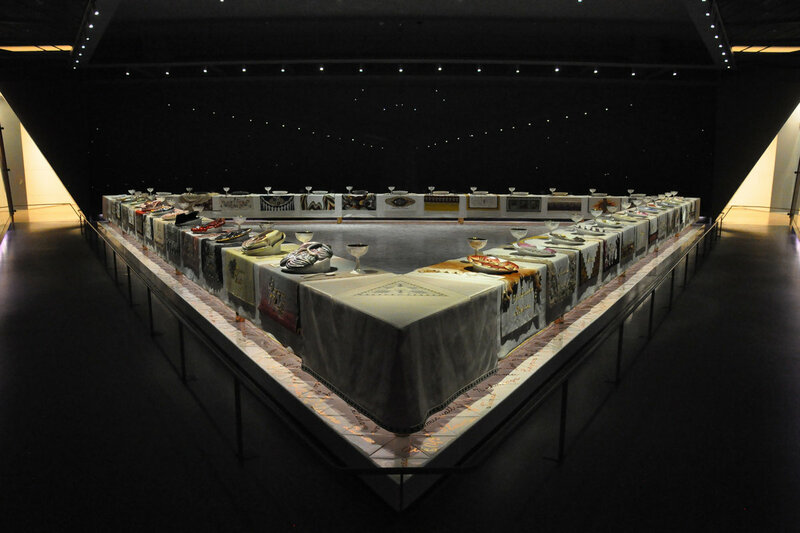 Judy Chicago is known for her installation called The Dinner Party. The installation is currently located in the Brooklyn Museum on the fourth floor. Bucknell Alumni Thom Tyson (class of 1970) filmed the production of this project. Tyson lectured my modern art class and described his experience working with Judy Chicago. He said it was very inspiring to watch one person lead hundreds of people who worked continuously for many hours each day for weeks. If you would like to watch a short version of Tyson’s film, click here. The Dinner Party was only one of Chicago’s many projects. Even though this project was just one step and event in her lifetime, this project was very impactful for women across the world. This project honored those women who were never recognized due to the historical sexism in our society. This was a huge past of the feminist movement in modern art and inspired many other artists to take it upon themselves to create pieces of art that also recognized sexism. For more information about Chicago and her work, click here. Previous PostLunch with Mr. MoynihanNext PostSup Bill? Great choice, I think it would be interesting to see learn about Judy’s use of art to raise awareness. Since we learned a little about Mike Daisey’s work to raise awareness of Apple. I would like to see what Judy has to say about using art and various methods of attack that can be used through art to send a message. How were the women incorporated into the installation chosen? Is it static? Is it frozen in 1979 in terms of who is included? Is using materials of the domestic space to honor women not reinforcing that the meal, the table, are feminine spaces? Or is it ironic?